Europe has few volcanoes. It lacks the volcanic magnificence of Indonesia, the grandeur of the Andes, the destructiveness of a St Helens or the beauty of a Fuji. But it can hold its own. This small continent, so small it had to borrow its plate from Asia, has volcanoes with history, volcanoes to be proud of. Etna is well know to be tallest active volcano in Europe. The BBC and Wikipedia tell us so: what greater authority could there be? But including dormant volcanoes, Etna is not even in the top 3. All the medals go elsewhere. But which are those unrecognized prize winners? Several sites give lists of volcanoes in Europe. But they seemed inconclusive to me, leaving out too many (wikipedia), or mixing dormant with extinct, or using non-standard boundaries of Europe. Being unable to find a definitive list of active or dormant volcanoes of Europe, I decided to make one of my own. This meant deciding on the borders of Europe. The common choice is to exclude Turkey but to include Russia – without Siberia. My chosen borders run through the Mediterranean, include the Aegean sea (arbitrarily following the Turkey-Greece border along the Turkish coast) back to Istanbul, pass through the Bosporus, and follow the ridge of the Caucasus through Georgia (the lost Tethys ocean) and go north through the (non-volcanic) Ural mountains. On the Atlantic side, I have taken the western-most point of Ireland as the western limit. My borders thus include Great Britain, Ireland, and the islands further north including Jan Mayen, but exclude Iceland and the Azores: I stay well away from the mid-oceanic ridge. The Canary Islands are also excluded, as in spite of their national affiliation and currency, they are on the African plate: (sorry, El Teide!). To count as an active or dormant volcano, the eruptive history and current state must make it plausible that a new eruption will occur. Extinct ones should be excluded. I did come across ones listed as dormant when they clearly had entered their eternal sleep. Only magmatic eruptions count: phreatic events by themselves do not, unless they indicate active or eruptable magma. There are some borderline cases! The mud volcanoes, such as in Berca, Romania, erupt water and soil instead of magma and are thus excluded. One also has to decide what counts as a separate volcano. For stratovolcanoes this is fairly easy: the main peak counts as one, including any satellite cones, but for a double peaked volcano it is less clear. I counted a double peak twice, if both peaks are separately able to erupt. This means that Vesuvius counts as one, as the second (older) peak is somewhat dead. For monogenetic volcano fields, where each individual volcano erupts only once, I have counted the volcanic field as one volcano. I have ordered them in elevation, from highest to lowest. This is unfair on volcanoes which grow from a low base, none more so than submarine volcanoes. If your volcano wants to reach the top, it should grow from the shoulders of the nearest giant. A mole hill in Tibet would beat most mountains in Europe. So, here is my list. Number 1 may surprise you, or if not, number 2 still may. A brief description is given for each (all deserve a post on their own). At the end are some I rejected, for various reasons. If you know one I missed, do let me know! Enjoy. Mount Elbrus, 5,642 m, Russia. Double-peaked Elbrus, located in the Caucasus mountains, is known as the highest mountain in Europe. Less well known, it is also Europe’s highest active volcano. Lava flows have been radio-carbon dated to 6250+-50, 4270+-40, 1330+-80, and 99+-60 years ago. Ice core studies of a glacier on top of the mountain have shown, beside global sulfate peaks such as from Katmai and Laki, some layers which appear to be from further local events, in one case including debris. The oldest eruptions of modern Elbrus have been dated to 250,000 years ago, but there was a prior volcano here, paleo-Elbrus, which has left an ancient caldera, measuring 17 by 14 km. The western summit is the highest peak; it has a small volcanic crater 250 m in diameter with fumaroles at the top, and thermal springs on the slopes. There is evidence for a 9-km wide magma chamber, between 1-7 km deep. Elbrus is certain to erupt again, and although most events are minor, the presence of extensive (and rapidly melting) glaciers makes any eruption potentially dangerous. Although at low probability, it also remains a candidate for a future caldera eruption. 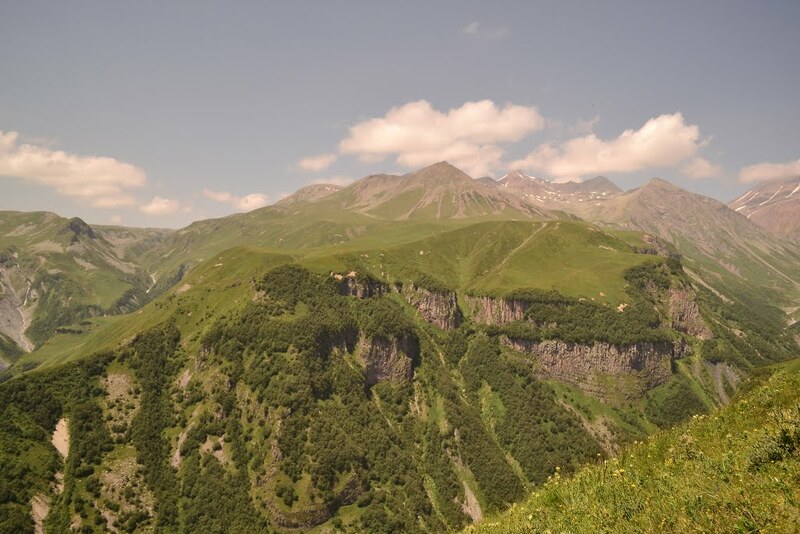 The European credentials of Mount Elbrus are strong: the mountain is well to the north of the main Caucasus chain, on European side of the Caucasus watershed. Mount Elbrus, 5,612 m, Russia. Although Mount Elbrus is a single mountain, it holds two volcanoes. The two peaks of Mount Elbrus are separated by a 5416-m high saddle. The two summits are almost the same height, and both are volcanoes which have erupted multiple times, and separately. Since neither can be considered as a satellite, and they erupt independently (albeit from the same magma chamber), they can each be considered as a volcano. This makes Mount Elbrus both the highest and second highest volcano in Europe. The eastern peak is the slightly lower one. This peak had a reported eruption around the year 50 AD. There is a 24 km long lava flow from just below the summit towards the east/northeast. Mount Kazbek, 5,047 m, Georgia. 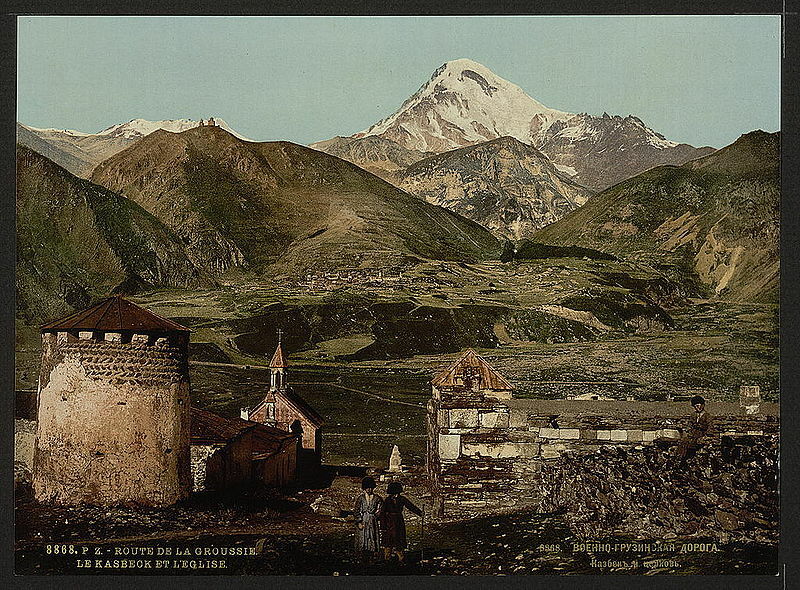 Like Mount Elbrus, this volcano is in the Caucasus, but whereas Elbrus is somewhat north of the main range, on the Russian side of the border, Kazbek is within the main mountain chain and is part of Georgia. Although in the main chain, it is still on the northern side of the watershed and thus qualifies as an European volcano. The water drains into the Terek river which flows into Russia before reaching the Caspian Sea. The central cone appears to have been quiescent for a long time, (perhaps as long 100,000 years), but satellite cones have sprung up on the slopes of the stratovolcano and these have erupted much more recently. The most recent eruption was around 750 BC, and an earlier one has been dated at 4000 BC, from the peak called Lesser Tkarsheti (2214 m). Distant ash covering Neanderthal sites in Russia has been chemically identified as coming from Kazbek, indicating a large eruption happened here 40,000 years ago, but it is not known from which peak. Over the past few hundred years, the main danger has been from glacier debris flows. The largest event was in 1776, when during a thunderstorm a gigantic ice-debris flow came down, blocking the Terek River for three days. A temporary lake formed, flooding several villages and drowning many people. When the Terek River broke the ice dam, it flooded the valley downstream. A smaller but more devastating event happened in 2002, when a large ice debris flow broke from the Kolka glacier, reaching speeds of 250 km/h and killing about 70 people. It may have been triggered by a small explosive vent but this is disputed. Even if an eruption in the next decades is unlikely, the region is subject to large earthquakes which can destabilize the steep glaciers. Global heating is affecting the region (the Elbrus glaciers have been thinning at 3 meters per decade since 1994): it is not known whether this could further destabilise the glaciers. This is a volcanic highland, covering 600 km2, which straddles the Caucasus watershed and could be considered as both part of Europe and part of Asia (in true fashion, a borderline case). The landscape appears lunar. It is a lava plateau, 2-3 km high, with three main levels, separated by ridges. 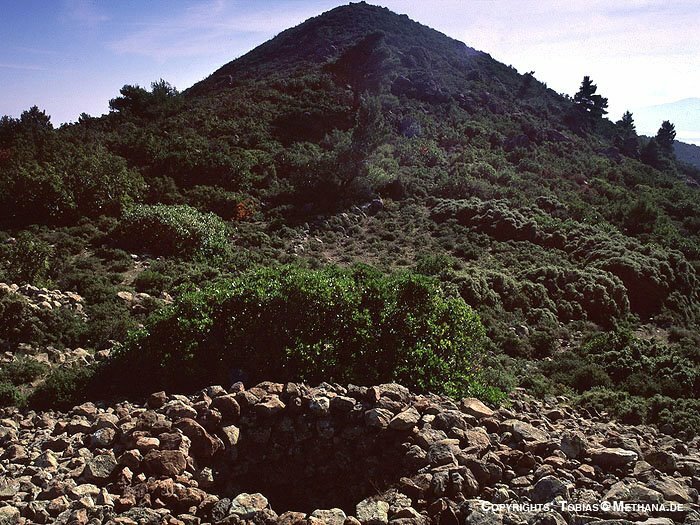 A large number of domes and scoria cones have formed on the plateau, mostly 200 to 300 m tall, some of which drain into Europe and other (more) into Asia. Most cones erupted only once (the technical term for this is monogenetic). Seven of the cones have erupted over the past 30,000 years, including Khorisa which drains into the Terek river. (The K-Ar isotopic ratios used for dating the flows do not work well for ages less than 35,000 years, and some of the flows could be much younger). The area is considered dormant rather than extinct: volcanic activity could resume. It is very different from Elbrus and Kazbek, as it has build one-off cones rather than a large stratovolcano. Why is Etna here? The main Italian volcanoes are to the north, and there is no known subduction zone underneath Sicily. There is however a major fault line running NNW-SSE, and extension along this weakness may allow magma to travel up. The Hyblaean Mountains, to the south of Etna, contain an older volcanic remnant, showing the area has been active for a long time; volcanism may have migrated a bit north. This is the only Scandinavian volcano on my list. It is located on Jan Mayen island, midway between Norway and Iceland. As an aside, it is the highest mountain on Earth with a Dutch name. Beerenberg last erupted in 1985. 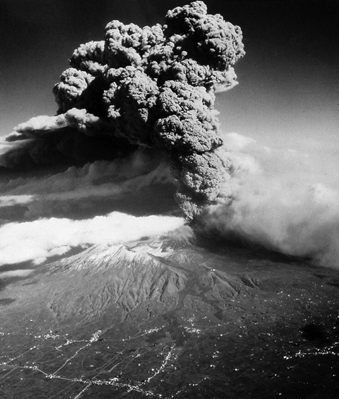 There are typically several eruptions per century. However, the weather is not great and the population is small, so much may be missed. The 1970 eruption was found by a passing plane and was missed by the locals who were not even aware their mountain was an active volcano. Chaine de Puys, 1886 m, France. This is a chain of monogenetic volcanoes, 5 km wide and 40 km long, in the Massif Central midway between Paris and Barcelona. The chain contains a large number of cinder cones, lava domes, and maars. 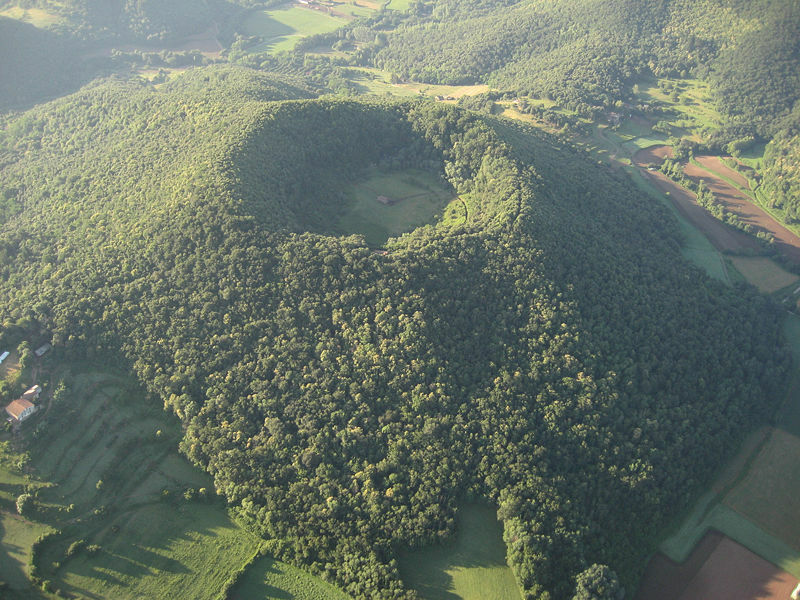 Most famous, and most scenic, is Puy de Dome. The tallest one is the Puy de Sancy. The cause of the volcanism is crustal extension, related to the on-going African collision. 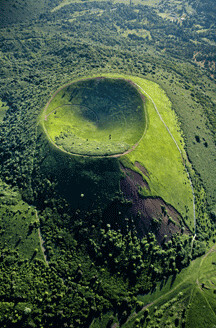 The Puys, the lava domes, formed between 17,000 and 6,00 year ago, during a series of 53 eruptions. The most recent dated eruption is 3840+-120 BC, although from an unknown vent. There is little evidence for continuing activity, but statistical analysis shows that after the flurry of events after the ice age, one would expect one eruption per 10,000 year. The current phase of quiescence is therefore normal, and the area should be considered dormant, not extinct. This became the most famous of the European volcanoes thanks to the unfortunate fate of Pompei. Its accessibility helped too: it is near a major city, low enough to be reached fairly easily while temperatures are mild enough on the top for the inappropriately dressed tourist, while it is safe, being as quiet as the proverbial dodo. But not as dead. It actually erupts regularly and these eruptions tend to be destructive. The last one was in 1944, and it almost wiped out the aircraft of the 340th Bombardment Group which were parked on a nearby airfield. Eruptions vary greatly in intensity and length of dormancy is unpredictable. But even a small eruption could be problematic to the dense population between it and the sea. Pompei could yet be buried again. Without doubt the most active of Europe’s volcanoes. It just never stops. This is the easternmost of the Aeolian Islands, north of Sicily, which also include Vulcano itself. The eruptions are mostly minor: the lava fountains reach up to 150 m above the vent. An eruption in September 1930 was more serious, when with little warning, two large explosions hurled blocks which destroyed houses in the village, a rock avalanche reached the sea and caused a 2-m tsunami, and several large lava flows occured. Six people were reported killed by the explosion, avalanche and tsunami. A repeat would seriously endanger many tourists. This is a volcanic field near Barcelona, with 38 monogenetic peaks. The magma appears to have come up via faults oriented NS. The most recent one is dated 11,000 yr ago. The region is not currently active and it is not clear whether it should be considered dormant or extinct. The region lines up with the volcanism around the Chaine de Puys and the Eifel, extending roughly NNS-SSE from Germany to southern Spain. All these regions are likely related to the crustal extension. This is a volcanic island, 8 by 13 km across, south of Sicily (closer to Tunisia than it is to Sicily). The island has fumaroles and hot springs. The highest peak is Montagne Grande but although covered in lava flows, it is not itself the source of the lava but was subject to uplift. There are two calderas, the younger (smaller) one from a 3.4 km3 DRE eruption 45,000 year ago. Since that time activity has steadily decreased. The last explosive activity has been dated to 3000 years ago. The best estimates puts eruptions at one per 13,000 years at the current time. 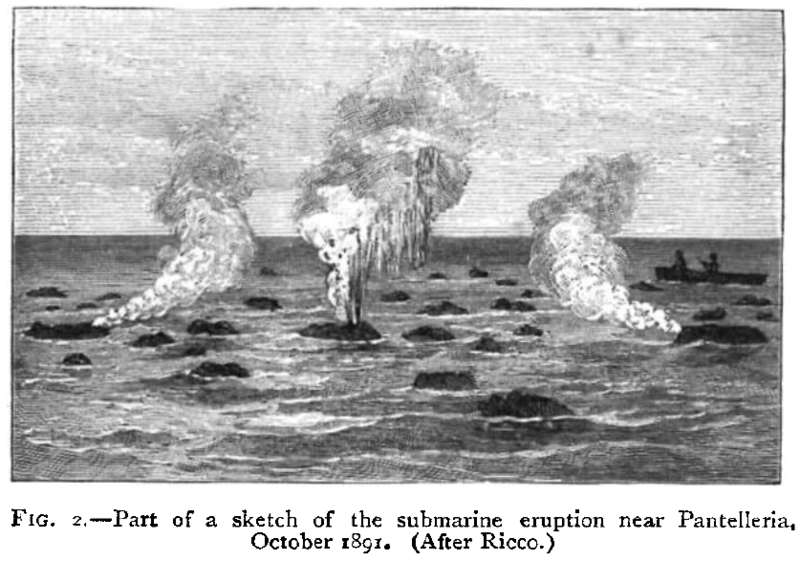 However, there was a subsea eruption in Oct 1891, 4 km northwest of the island. Earthquakes and uplifting occured in the north of Pantelleria a year before the eruption, and again 3 days before; the uplift was about 80cm in the north of Pantelleria. The eruption happened in deep water (more than 100 meter) and gave floating debris and a smell as of gun powder, but did break the sea surface. It happened along a 1-km line, perhaps a rift or dyke. The cause of the volcoanism is movement of Sicily: it is rotating clockwise, puling the sea floor here apart. This volcanic outcrop is the site of a major eruption 56,000 yr ago. It is 30 km from Naples, and is related to Campei Flegrei but far enough away to deserves to be included in its own right. The island formed from resurgent doming after a large eruption 33,000 years ago. Since than, eruptions have come from small one-off vents. The most recent eruption, with a small lava flow, was in 1302, when a lava flow ran 3 kilometers to the sea from a new vent at Campo del Arso. A number of eruptions were reported during roman times, and the time since the last eruptions may be longer than average. A new eruption is plausible but it may take several 100 years. The Methana peninsula, only 50 km from Athens on the Aegean coast, has a series of volcanic cones, on land, on islands and under water, and suffers fairly regular small eruption. The most recent one was probably in 1922 but has not been confirmed, in Kameni Vouno, on the nortwest side of Methana. There was a subsea eruption in 1707 and Kameni Vouno also erupted around 258 BC, when a flank eruption produced andesitic lavas which reached the sea, build a new dome with a 100-m crater. The region is considered dormant apart from the many hot springs, but this volcanic eruption shows that it should be included on this list. This small island, just off the coast of Turkey in the Aegean sea, has a 10 km2 caldera, which reached it current size 45,000 year ago when tephra was spread over the surrounding area. This eruption is estimated at 2-3 km3 DRE and produced pyroclastic flows which covered the island. The volcano is still active and has occasional small eruptions, but the last four (1422, 1871, 1873, 1888) have probably been phreatic only. 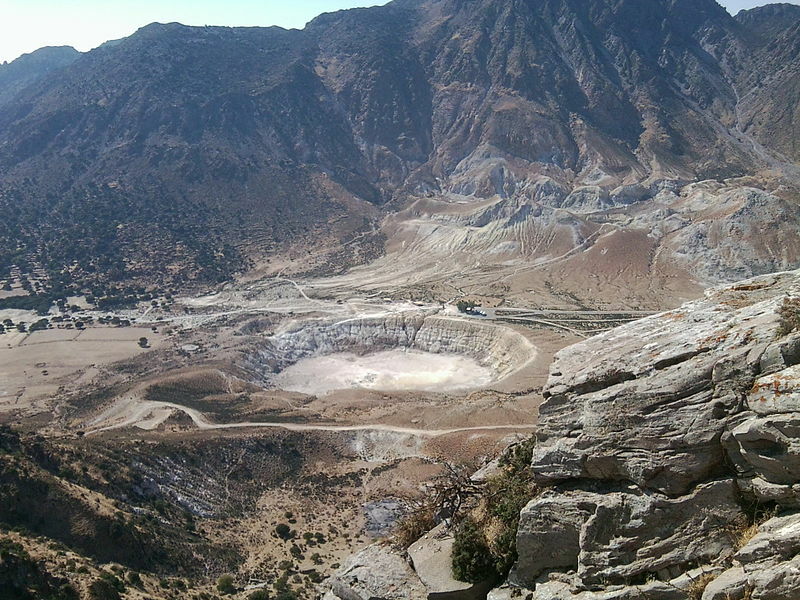 Stefanos, the largest crater, is also phreatic. A borderline case: it is not clear whether the magma chamber is still sufficiently evolving to count as active. An earthquake swarm in 1997, reaching M5+, may have been due to an injection of fresh magma. This is the largest island of the Aeolian island arc. It is not nearly as active as Stromboli, but it does have occasional eruptions. An explosive event occured at the Monte Pilato around 600 AD, leaving a layer of debris on the nearby island of Vulcano. A more recent event, the Rocche Rosse eruption, occured in 1230+-40 AD, starting explosively followed by an obsidian flow and forming a small tuff cone. Not a joke: there is an island called Vulcano, it has an active volcano, and it is the origin of the word. Every volcano in the world is named after this island, just north of Sicily. The last eruption was in 1888-1890, including explosions which hurled blocks on the land and into the ocean. A long-lasting effusive eruption occured in 1731-1739. 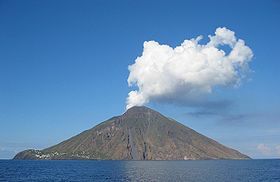 One of the eruption centres, Vulcanello, grew into a separate island during an eruption in 188 BC; it became connected to the main island in 1550. There are two overlapping calderas, 100,000 and 20,000 years old. Vulcano is the southernmost of the 7 main Aeolian islands, all volcanic in origin, which together form a small island arc. The arc also includes Stromboli and Lipari. 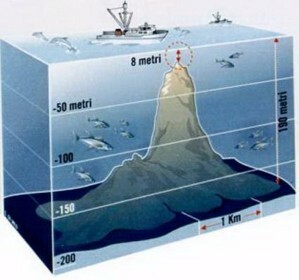 There are several seamounts as well. The cause of the volcanoes appears to be a combination of an old subduction event (which may have stopped now) and tectonic fault lines, oriented NW-SE to NE-SW, causing extension of the crust. The Aeolian Islands can be considered as the origin of the science of volcanology. Two eruption styles, vulcanian and strombolian, are named after this region. Pozzuoli (Campi Flegrei), 458 m, Italy. in the bay. It has been discussed extensively as #3 of the NDVP list on this blog. Laacher See, 275 m, Germany. 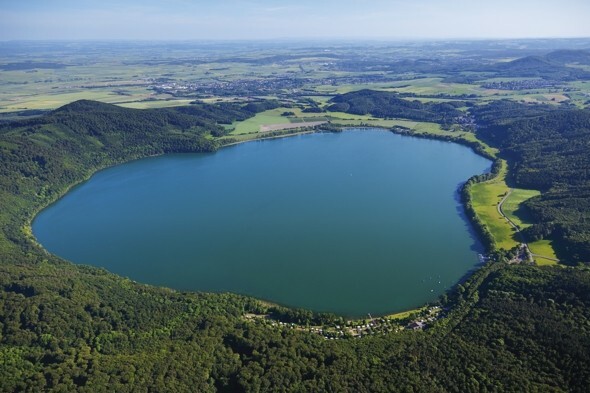 This 2-km wide lake is a caldera in the west-Eifel volcanic field, in the Rhine valley. The small size of the lake belies the eruption: ash from this explosion is found over much of Europe, and it is believed to have been a VEI6 eruption, Pinatubo like. The crater formed about 12,000 years ago and is the only caldera in Europe north of Italy. Eruptions in the region are infrequent, with the previous large eruption happening 100,000 years ago. Numerous maars in the area show that small eruptions are more common, and these are the main hazard. A new eruption here is currently not on the cards, but the given the fairly recent major eruption, it is unlikely to have gone extinct. Santorini / Kolombo, 114 m, Greece. Little was left of the original island after the famous Thera eruption around 1630 BC which devastated the Mediterranean and destroyed Crete. The remnant of the caldera wall is now densely populated. New eruptions formed islands within the caldera: Palia Kameni (197 BC, 46 AD, 726 AD), Mikra Kameni (1570), Nea Kameni (1707, 1866), where Nea Kameni swallowed Mikra Kameni. Nea Kameni is currently 3 km2 and 114 m tall. It last erupted (very minor) in 1950. About 7 km away, outside of the caldera, Kolombo volcano breached the surface in an intense eruption around 1650 (killing about 70 people) but it has since sunk to 18 m below. Kolombo seems connected to Santorini by a dyke, making it a satellite which is why I chose not to list it as a separate volcano. Nea Kameni seems the most likely place from where Santorini will rebuild itself. However, the region around Kolombo, and further NE of there, is seismically very active and it is possible that Santorini will move. This is one of 13 underwater volcanoes located between Sicily and Tunisia. It last erupted in 1867. This large area includes several eruptive sites, which might count as separate volcanoes. Ferdinandea briefly appeared above sea level after an 1831 eruption. It is currently 8 m below sea level. Panarea, Italy. 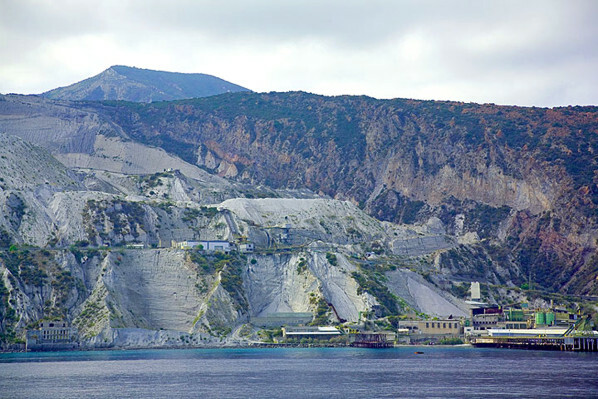 This is the smallest of the Aeolian Islands, and is considered dormant because of continuing occasional underwater activity, such as a gas eruption in 2002. As there is no record of or date for any volcanic eruption, I have not included it. However, if evidence emerges it may need to be added to the list. Alban Hills, 950 m, Italy. This volcanic complex overlooks Rome. The last eruption has been dated to 35,000 years ago, so this may be considered extinct. However, the mountain is still emitting copious amounts of CO2 and occasional uplift which may be hydrothermal or magmatic. A borderline case between extinct and dormant. Mount Kabardzhin, 3,136 m, Georgia. It is near Mount Kazbek in the Caucasus but is considered a separate complex. Wikipedia lists it as ‘dormant’ (under the name Mount Khabrajina), but it has not erupted for 100,000 years and should be considered safely extinct. Google maps doesn’t know this one: try the coordinates 42.57171, 44.5565 to find it. Mount Ciomatu in Transylvania (Rumania). In spite of not having erupted for 32,000 years, it is listed as dormant rather than extinct. The last eruption formed a crater lake, St. Ana. The reason to list it as dormant rather than extinct may be touristic. There is uncertainty whether the latest eruption was phreatic or had a magmatic component: see this thesis for more information! Milos, 748 m, Greece. The region with surrounding islands has an extensive volcanic heritage but no central volcano. It had a large eruption 90,000 year ago which formed the volcanic crater which now is the harbour, ringed by the remaining island. There is large geothermal heat reservoir underneath, giving rise hydrothermal activity leaving debris and mud deposits. There was a hydrothermal explosion as recent as 140+-60 AD. However, I found no evidence for recent magmatic activity. Calatrava volcanic field, 700 m, Spain. A lesser known volcanic area in Spain, south of Madrid. It lies at the end of the linear line connecting the Laacher See, the Chain de Puys and Garrotxa. The most recent outcrop is the Columba volcano. The events here have been Strombolian volcanicsm and hydrothermal explosion, beginning 8 million year ago. Although sometimes listed as dormant, volcanic eruptions seem to have died down 700,000 year ago. The most recent event has been carbon-dated to 6000 years ago, but this was phreatomagmatic. The area shows a large number of maars, indicating such explosions remain fairly common and could re-occur. Studies of the volcanic deposits have also shown that earthquakes up to M7.5 have occured here and this may be the main hazard in the area. Europe has enough volcanoes, most actively along the southern edge but also in the heartland, from Germany to Spain. 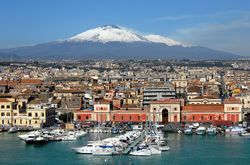 Stromboli can hold its own against Hawaii; Vesuvius can give St Helens a run for its money and is peak tourist fodder besides; Elbrus could have pride of place in many countries. Just choose your borders wisely. It happened in Iceland – could it happen in Europe? New post is up (sorry for the slow post eruption rate). Trouble in paradise. I will not comment extensively on the issue of the dormant vs extinct status of Mount Ciomatu. Anywhay the annoying thing is that you placed Mount Ciomatu in Transylvania (Hungary) which is obviously a serious error as Transilvania is a mostly romanian inhabited region and has been part of Romania since 1918. It is true that the Harghita/Covasna area is inhabited by ethnic Hungarians (by some 90%) and that is ok with me. The area could even be autonomous in my opinion (the comunity is united and keen on keeping their native language) and I would not find this offensive at all. It is just annoying it is just so easy to ignore geography and borders. Sometimes this is enought to start flame wars between Ro and Hu idiots and this is something that I would not want to see here. So for the purpose of scientific accuracy , please identify Mt. Ciomatu on a proper map and please correct the article. If times permit it would be also nice to check some scientific literature concerning the volcanic arc in the Eastern Carpathians (Romania). Of course the geological controversy concerning Mt Ciomatu is actually significant so there are reasonable argument to not consider a 500k old volcano extinct just because of an 33k years gap in activity. Also please excuse any typos/spelling issues in my messages. Thanks for the information. The obvious error of misplacing Mount Ciomatu in the wrong country has now been fixed: thanks for pointing this out. The error was entirely mine, and we do rely on our readers to find our unintentional mistakes. Perhaps you would be willing to write a post for this blog on Ciomatu! The reason I had not included it in the list is that the evidence for ongoing magmatic eruptions wasn’t sufficient. There were some uncertain cases among the european volcanoes and this was one of them. Phreatic activity was in itself not enough to make the list. Several people have pointed out omissions or corrections on the original list and I have tried to include these where time and evidence allowed.